Hiring the Buckland Filleigh Village Hall The committee room upstairs is just and the hall itself can be booked seperately per evening (heating extra). Call 01409-281535 for more details. As Parish Archivist, I am putting together an exhibition about Buckland Filleigh and the First World War to be displayed at the Armistice Day Lunch in the village hall on 11th November - if anyone has any information, photos or memorabilia you would be happy to lend or have copied to be included that would be great! I am particularly interested in any items relating the men commemorated on the parish War Memorial: Frank Badock, Alfred John Badock, Hubert Barriball, Frederick Victor Barriball, Thomas Brock and Samuel Glover and anyone who served the First World War. Additionally, all those attending the lunch are encouraged to bring photos and details of their family members who served in any conflict or who were involved on the home front - there will be a Memory Board available to display these on. There is not space here to write about all those who served during the First World War, but I thought I would take the opportunity to focus on several of the men whose stories I have been able to piece together. 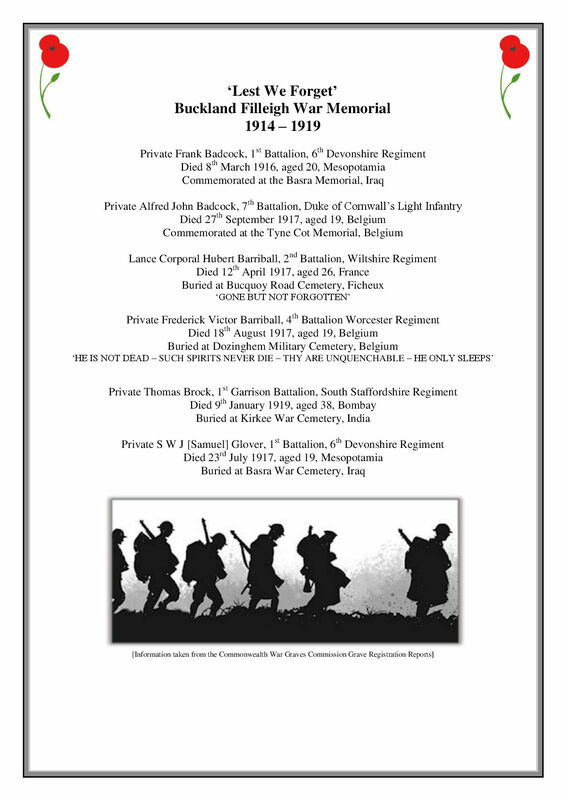 Further information on all the names will be displayed in the history exhibition at the Armistice Day Lunch or have a read of Buckland Filleigh: A Continuous Thread where author Jane Taylor has written a section on the war. Families of servicemen were offered the opportunity to add their own words to their loved ones' headstones and the boys' mother, Mrs. Annie Barriball requested the above. It was not always easy (or affordable) for grieving relatives to visit war cemeteries and memorials scattered across France and Belgium (and others across the world), so this personal touch was a way of remembering her lost sons. Another way for both families and communities to commemorate men who had fought during the Great War was to subscribe to the creation of war memorials and rolls of honours. These were placed in prominent locations in towns and villages - in churches and churchyards, on villages greens, in public gardens or town squares. Quite often you will find men's names on several different ones! Willian Badcock is named on both the Buckland Filleigh and Shebbear rolls of honour. While his parents lived in Buckland Filleigh, William actually lived in Shebbear with his wife Alice and family - hence the doubling up. However, as his two brothers, Frank and Thomas are commemorated on the Buckland Filleigh War Memorial it is fitting that he is remembered here, too. Thomas Brock, a Shebbear man, is also honoured, which is slightly curious as his family seems to have no connection to the parish (having recently found his death notice, which was published in a local newspaper, it reveals that he had lived at Woodhead, so there is the connection to Buckland Filleigh after all). 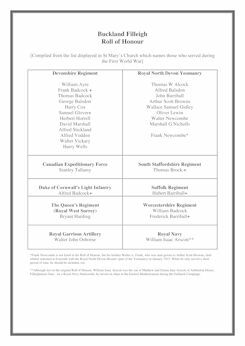 However, he is listed in the 'Gallantly Served' section of the Shebbear memorial in St Michael's Church rather than under 'Victorious Fallen'. Perhaps news of his death in January 1919 only reached his wife after this memorial had been commissioned, so he was included in the neighbouring parish (Thomas Brock had sadly died of cholera in Bombay, where he was serving with the South Staffordshire Regiment). One name - or rather of the regiment in which he served - which stands out on the Buckland Filleigh Roll of Honour is that of Alfred Tallamy, '82nd Battalion, Canadians'. Alfred, who was born in the parish was the son of Christopher and Clara Tallamy who lived at Lower West Heanton, then St Clair. At some time between 1911 and 1915 he emigrated to Canada. Many young men (and women) during the early 20th Century decided to make the journey to the British Imperial dominions of Australia, Canada, New Zealand and South Africa, which were all keen to welcome hard-working immigrants to boost their populations. At the time of his enlistment in Calgary in September 1915, Alfred (aged 23) was working as a waiter. He was 'taken on strength' of the 82nd Battalion of the Canadian Expeditionary Force which embarked from Halifax, Nova Scotia, for Britain in May 1916. His service record, available online from the Canadian National Archives, shows that he served in France, was demobbed in 1919, but decided to remain in the U.K. after the war, giving his residence address as Buckland Filleigh. Alfred Tallamy died in 1951 at Glebe Cottage and is buried in the churchyard. Finally, a name I have added to the Roll of Honour is William Isaac Arscott, son of Matthew and Emma Jane Arscott of Ashburton House at Filleighmoor Gate. Like his father and brother John, William trained as a blacksmith, but chose to enlist in the Royal Navy in 1891 at Devonport, aged 23. At a time when the British Navy 'ruled the waves' skilled metal artisans such as William were needed both in the dockyards and onboard, maintaining and repairing ships. During the war he served on several ships based in the Mediterranean, including the depot ships HMS Hussar and HMS Blenheim, and initially HMS Ocean. His service on this battleship ended on 18th March 1915 which is significant because HMS Ocean sank after colliding with a Turkish mine which exploded, and then being hit by a torpedo! This happened in the Dardenelles during an attempt by a group of British warships to force its way through the straits. Luckily, HMS Ocean did not sink immediately and almost all the crew, including William Arscott, were taken off safely. He remained in the Eastern Mediterranean helping to support the Gallipoli Campaign, returning to Devonport in late 1917. He demobbed in January 1918 (aged 48) to take up civilian employment, having completed around 25 years' service in the Royal Navy. Later in life he returned to live at Lake Farm, Sheepwash (part of the Buckland Estate), where he died in 1943; he is buried in St Mary's churchyard. 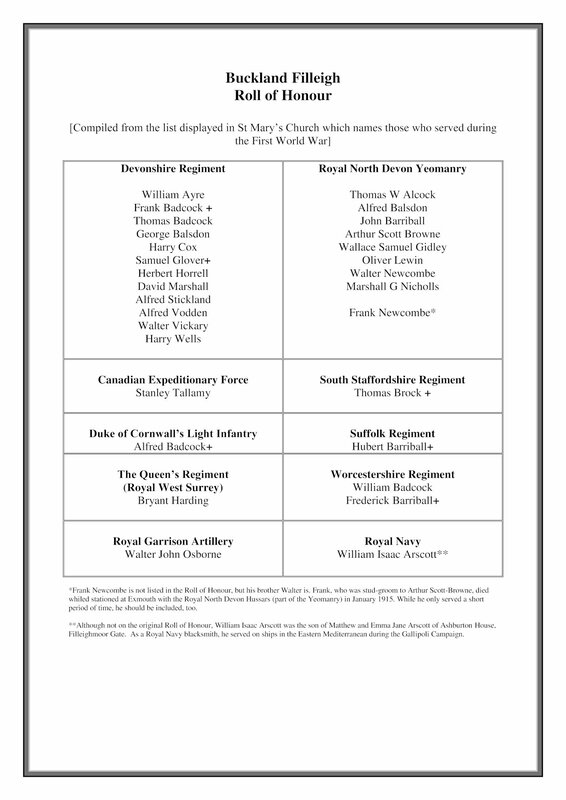 Perhaps William is listed on a roll of honour elsewhere, but since his family have a strong connection to Buckland Filleigh, it is nice to recognise his war service here, too. This project was originally planned to record the inscriptions on the old grave stones before they were lost fore ever. With a few exceptions, all the gravestone (old and new) standing in this beautiful setting, have been deciphered and recorded. Hopefully this record will prove to be of interest to those looking for ancesters, and those interested in local History as well as others not connected with the Parish. Many of the inscriptions make fascinating, if heart rending reading. There is a photograph of each gravestone. In many cases there is also a short biography of the life of the person to whom the burial refers. The disc is on sale in the Parish for £5, or by post for £ 6. from Emma Anderson anderson.isca@googlemail.com and phone number 01409231294. "...it was during the last 50 years that the most dramatic changes had taken place in the Parish. Buckland Manor had survived into the mid Twentieth Century. This is unusual, but now the way of life associated with the Manor, which had continued generation after generation, has disappeared. The mixed pattern of farming, using small fields surrounded by high banks topped with a hedge, which I knew as a child, was the continuation of an agricultural system going back more than a thousand years. One hundred years ago every one living in the Parish was involved, directly or indirectly in farming and/or the Manor. Even fifty years ago most people living in Buckland Filleigh worked on the land, or serviced those who did. That has all changed...."
The above shows that in 1911 Arthur Scott Browne was a wealthy man. As in 1901 he and his wife ran a large prosperous establishment. This wealth did not come from the Buckland Filleigh Estate which I would believe have been a “drain” on his resources. It was the wealth accumulated by the family in South Australia that financed both this affluent life style and underpinned the whole estate. There were 14 servants living in (10 actually working in the house) There could also have been other servants who came in daily from the local area (no mention of a cook in above list) Interesting that there was a chauffeur and a coachman. Also interesting that most of the servants were not local, infact half came from outside Devon. "BUCKLAND-FILLEIGH, a parish in Torrington district, Devon; 6½ miles NW of Hatherleigh, and 10 S of Bideford r. station. Post Town, Shebbear, under Highampton, North Devon. Acres, 3,037. Real property, £1,872. Pop., 258. Houses, 46. The property is divided among a few. The manor belongs to Lord Ashburton and Lord Clinton. Buckland House is a seat of Lord Ashburton. The living is a rectory in the diocese of Exeter. Value, £218. Patron, the Bishop of Exeter. The church stands close to Buckland House; is a handsome small edifice; and contains monuments of the Filleighs and the Fortescues." "The Parish is celebrated for its beautiful woods, little ivy mantled church above the lake, and its commanding views of Exmoor, Dartmoor, and the Caredon and Warbstow hills in Cornwall."